J Crew’s crystal and metal necklace (07732, $138) is currently on sale for $99.99 online. It was $109.99 in-store on 11/18. This was showing up as final sale online & I didn’t want to order it without trying it on first. I love it. I didn’t think I’d like the metal heart shapes. I thought they might look like something made in Shop Class. The metal is fine. The stones are so sparkly and I like the length of the necklace. Will re-do this pic. The stones are gorgeous. 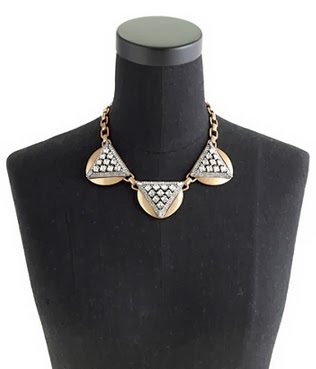 Crystal triangles necklace (A1966, $135) – I ordered this one on one of the recent promos. I tried it on in-store when I above the crystal and metal necklace (above). This one sits higher on the neck. Not a fan of the way it looked on me. I’ll be returning it. Crystal triangles bracelet (A1968, $98) – I ordered this one along w/the necklace. I tried it on in -store. The way it sat on my wrist made it look like a bow. Love. Its like you read my thoughts! You seem to understand so much about this, such as you wrote the e-book in it or something. I feel that you could do with a few p.c. to pressure the message home a bit, but instead of that, this is fantastic blog. An excellent read. I’ll certainly be back. I’ve read a few excellent stuff here. Definitely price bookmarking for revisiting. I wonder how so much effort you put to create such a magnificent informative web site. We went here by a different web address and thought I might as well check things out. I like what I see so i am just following you. Look forward to looking at your web page repeatedly. I am only commenting to make you be aware of of the magnificent encounter our girl went through going through your web site. She even learned some things, most notably what it is like to have an amazing teaching heart to get most people really easily grasp certain specialized topics. You undoubtedly exceeded our own desires. Many thanks for offering the good, trustworthy, edifying not to mention unique tips about that topic to Janet. Thank you for all your valuable effort on this blog. Kim take interest in setting aside time for investigations and it’s easy to see why. A lot of people hear all relating to the dynamic tactic you offer very important guidelines via the web site and as well as welcome response from other ones about this subject matter then our favorite princess is really starting to learn so much. Take advantage of the remaining portion of the year. You are doing a pretty cool job. The core of your writing while sounding agreeable initially, did not work perfectly with me personally after some time. Somewhere within the paragraphs you managed to make me a believer unfortunately only for a very short while. I nevertheless have a problem with your leaps in logic and you would do well to fill in all those breaks. In the event that you actually can accomplish that, I would certainly be impressed. I simply want to mention I am just beginner to blogging and absolutely liked this blog. Most likely I’m going to bookmark your site . You definitely have excellent writings. Thanks a bunch for revealing your blog. I just want to mention I’m beginner to blogging and absolutely loved you’re blog site. Likely I’m planning to bookmark your blog post . You really come with fantastic article content. Kudos for sharing with us your blog. I simply want to say I am newbie to blogging and actually liked your web-site. More than likely I’m likely to bookmark your blog . You really come with really good article content. Bless you for sharing your webpage. I simply want to mention I am just very new to blogging and site-building and certainly savored this web page. Most likely I’m going to bookmark your blog post . You definitely have outstanding article content. Appreciate it for revealing your web page. I simply want to tell you that I’m very new to blogging and seriously savored you’re web site. Probably I’m going to bookmark your website . You actually have superb article content. Cheers for sharing your blog site. I just want to tell you that I’m beginner to blogs and absolutely liked you’re page. Likely I’m going to bookmark your site . You actually have wonderful article content. Appreciate it for sharing your blog site. fantastic issues altogether, you simply won a logo new reader. What may you suggest about your post that you made some days in the past? Any certain? I simply want to say I am beginner to weblog and absolutely loved you’re blog site. Most likely I’m want to bookmark your blog post . You really have remarkable stories. Thanks for sharing with us your web site. I just want to tell you that I am beginner to blogging and certainly enjoyed you’re web-site. Most likely I’m going to bookmark your blog post . You certainly come with terrific well written articles. Appreciate it for sharing your web-site. I simply want to mention I am just newbie to blogging and site-building and definitely liked your web-site. Probably I’m want to bookmark your site . You definitely have remarkable stories. Many thanks for sharing with us your webpage. I simply want to say I am just all new to blogs and seriously loved you’re web site. Probably I’m likely to bookmark your blog . You amazingly have remarkable writings. Thanks a lot for sharing your blog site. Simply desire to say your article is as astounding. The clearness in your post is simply spectacular and i could assume you’re an expert on this subject. Well with your permission allow me to grab your feed to keep up to date with forthcoming post. Thanks a million and please keep up the enjoyable work. I have learn a few just right stuff here. Definitely worth bookmarking for revisiting. I wonder how much effort you set to create this sort of wonderful informative website. You can definitely see your enthusiasm within the work you write. The world hopes for more passionate writers such as you who are not afraid to mention how they believe. All the time go after your heart. You made certain nice points there. I did a search on the issue and found most persons will agree with your blog. Spot on with this write-up, I actually believe that this amazing site needs a lot more attention. I’ll probably be back again to read more, thanks for the info! wonderful points altogether, you simply won a emblem new reader. What might you suggest about your post that you just made some days ago? Any sure? You should take part in a contest for one of the highest quality blogs on the internet. I am going to recommend this blog! Hello, Neat post. There’s an issue together with your web site in internet explorer, might check this¡K IE nonetheless is the market leader and a huge part of folks will pass over your excellent writing because of this problem. Hi, I do believe this is an excellent website. I stumbledupon it 😉 I’m going to come back once again since I bookmarked it. Money and freedom is the best way to change, may you be rich and continue to help other people. Hi there! I could have sworn I’ve visited this website before but after looking at many of the posts I realized it’s new to me. Nonetheless, I’m definitely happy I found it and I’ll be book-marking it and checking back often! Hello, I do believe your web site could be having internet browser compatibility problems. Whenever I look at your site in Safari, it looks fine however, when opening in Internet Explorer, it’s got some overlapping issues. I simply wanted to give you a quick heads up! Other than that, excellent blog! Excellent site you have got here.. It’s hard to find high quality writing like yours these days. I seriously appreciate people like you! Take care!! Wow, amazing weblog format! How lengthy have you been blogging for? you made blogging look easy. The overall glance of your site is excellent, as neatly as the content material!